AUTOYOUTH is a registered brand, we offer an all-round solution to more owners who seeks for beauty and individuality and make their motorcycles or vehicles full of energy and youth. AUTOYOUTH always insists on offering a lower price, innovative design and high quality auto parts and accessories to customers all over the world. The core of our brand is creating perfect user experience and focusing on the rationality of product from its design to use. Make customer be our media, let product prove our value. AUTOYOUTH brand Seat covers can extend the life of your vehicle and keep your seats looking new and clean. Update the appearance, protect against spills, stains, fading, dirt, pet hairs and protect your car seats from wear and tear. AUTOYOUTH seat covers fit most of the standard vehicles(not all vehicles ) universal for regular models. Items dimension: front seat: 46.46 inches long x 22.05 inches wide rear bottom: 51.97inches long x 21.65 inches wide rear backrest: 51.97inches long x 25.19 inches wide. 2 front bucket covers, 5 headrest covers, 1 rear bench seat cover, 1 rear backrest cover, 1 bag hook accessories and 1 piece installation instructions, due to installation requirement, please ensure your headrests can be detached before buying this set and be careful when you install. AUTOYOUTH offer 24 months Warranty Period from the date of purchasing. 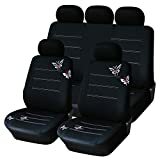 We hope you will love our seat covers and have a nice shopping experience here, if so, share with your friends; if you have any questions, you are coved by our money back guarantee.